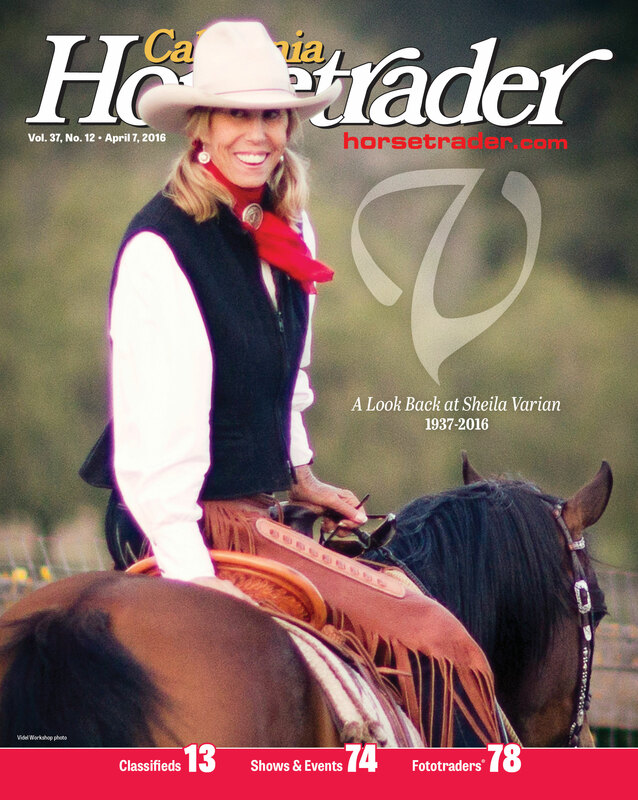 ARROYO GRANDE—California’s horse world lost a giant March 6 when Sheila Varian, whose passion, thoughtfulness and drive inﬂuenced a generation, passed away after a battle with cancer. She was 78. Varian’s impact on the world of Arabian breeding in the U.S. is diﬃ cult to exaggerate—70 percent of show horses winning today carry Varian blood, according to her ranch website, and according to Arabian Horse World magazine’s statistics, Varian Arabians is the alltime leading breeder of English horses as well as the alltime leading breeder of Western horses. Nine generations of Arabians have been bred by Varian Ranch since it imported *Bachantka from Poland in 1961. Raised on the Central Coast with a strong horse interest, she was introduced early on to the vaquero, or “Californio”, tradition of western riding. A major inﬂ uence was Sid (Mary) Spencer, owner of a ranch in Lopez Canyon where Sheila, in her teens, learned from Sid about training hackamore horses and spade bit horses and how to work cattle in the mountains. With the assistance of her parents in 1954, she started her horse ranch. By 1963, she was raising and training horses full-time, drawn to use the vaquero-inﬂ uenced methods of training on Arabians, a breed she thought required a smart yet gentle approach. Her breeding program began with a small number of mares whom she bred to her national champion stallion, Bay Abi. She then acquired three mares from Arabian farms in Poland at a time when that nation was still behind the Iron Curtain and importation of horses to the U.S. was diﬃcult. These mares and Bay Abi formed her foundation bloodstock. Varian received recognition from the United States Equestrian Federation, as well as several awards from various organizations within the Arabian horse industry. For her contributions as breeder and as a horse trainer in the vaquero tradition, she was inducted into the National Cowgirl Museum and Hall of Fame in 2003. Varian was diagnosed with cancer in 2013 and subsequently sought to place the 230-acre Varian Ranch into a conservation easement to protect the land from development. Last year, a partnership was reached with the California Rangeland Trust to meet that end, with plans to purchase “development rights” and allow her ranch manager, Angela Alverez, to continue operating the breeding program for at least a decade beyond Varian’s departure. • 1961 – Sheila and her Arabian mare Ronteza won the Open Reined Cow Horse Championship at the Cow Palace in San Francisco. She was the ﬁ rst amateur, the ﬁ rst woman and had the ﬁ rst Arabian to take that title. • 1962 – Sheila showed the Varian Arabians foundation sire Bay-Abi++ to win the Championships U.S. National Champion Stallion competition. • 1969 – Sheila trained and showed Bay Event (Bay-Abi++ x Ronteza) to open Reined Cow Horse Championships throughout California. • 2003 – Inducted into the Cowgirl Hall of Fame, in Fort Worth, Texas.